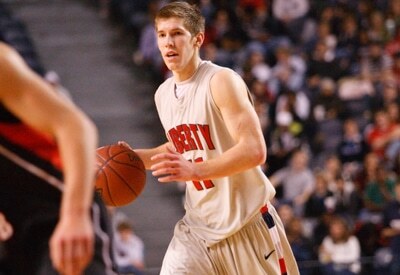 Having been blessed with the ability to play basketball in college (Liberty University) and also professionally overseas. This has allowed me to be able to be around some really good basketball coaching. During my playing career I have had my fair share of off season training sessions with coaches and on my own. These were times that I really valued because I always wanted to be improving as a player. A big part of my improvement came from my coaches working me out and teaching me different things about the game in the off season. Now that I have been able to coach and help develop some of my own players I have thought back and tried to remember what worked best for me as a player, and what helped me to improve the most. The goal of this article is to provide you as a basketball coach with a little bit of feedback from the players side of skill development and also just some of the tips that I have learned over the years from some of the great coaches that I have had. You wouldn't eat the same thing every single day, because you would get tired of it, it would lose taste, and eventually you would hate it. It is the same idea for your basketball training. Players get tired of doing the same thing every workout and will begin to become unmotivated the longer you continue to do the same thing over and over again. Keep the material fresh and challenging to keep the players engaged and getting better. There are tons of different basketball drills that work on basically the same thing, so don't get caught up on the same 3 shooting drills or ball handling drills for every workout. College and high school basketball coaches are always trying to develop mental toughness or do drills that teach their players to compete. These things need to be taught and they are very valuable to a team. However in doing this coaches often forget to teach the game to their players. Every workout doesn't have to be pedal to the floor, go 110% the whole time. Take time to teach a player how to move without the basketball, the right way to duck in on the post, etc. They need to be fully locked in but not every workout needs to be physically demanding. Don't assume that because you know how to do something that they also do. Most players have a pretty low basketball IQ and need to be taught the game on both ends. If I knew everything that I know now when I was a player, I would've been a lot better. When you go to the doctor they don't just handout a general pill that makes everyone better and treats every sickness. They evaluate you, figure out what is wrong with you, and then prescribe you medicine. You are your players doctor! Not every player needs to work on the same thing so stop lumping them all together! Evaluate each players weaknesses and strengths on and INDIVIDUAL basis and then figure out how you are going to work on making them a better player. Some players may need to work on learning to compete but if you have a player that dives on the ground after loose balls 18 times a practice, don't have him working on toughness drills. Help him develop one of his skills. If you are a coach and you are not using film to help your players learn than you are seriously missing out. This not only will make it easier for you to show them what you want from them, but it will also help them learn the game and save their legs. You can do this by position or individually with each player. I would recommend 2-3 times a week for only about 20 minutes at a time. That way you don't overload your players and you can show them a few things that are really going to help them learn and develop. Taking the time and investing in developing your players in the off season will pay dividends during the season. I hate hearing the excuse, "It is really hard to get good players to our program." Instead of saying that, why don't you go develop some of the players that you already have? I went from being a walk on my freshmen year to being the 19th ranked shooter in the country by Fox Sports my senior year. This happened because my coaches were committed to helping me develop as a player. You owe it to your players and your team to do your best to develop each person on your team to the best that they are capable of being. Good philosophy. Try and make sure your goals and your schedule are connected… protect training hours.